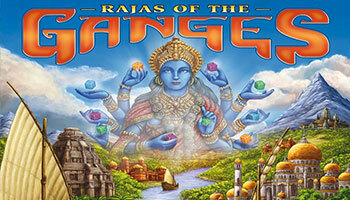 In 16th century India, the powerful empire of the Great Moguls rises between the Indus and the Ganges rivers. 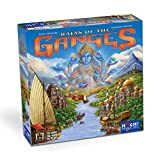 Taking on the role of rajas and ranis – the country's influential nobles – players in Rajas of the Ganges race against each other in support of the empire by developing their estates into wealthy and magnificent provinces. 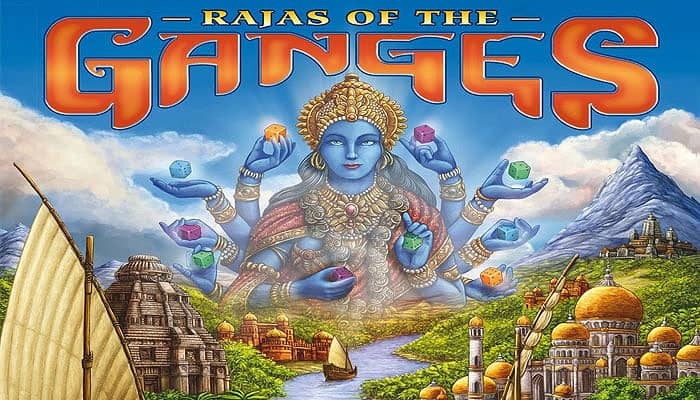 Players must use their dice wisely and carefully plot where to place their workers, while never underestimating the benefits of good karma. Success will bring them great riches and fame in their quest to become legendary rulers. India in the era of the aspiring Mogul empire. New lands are being gained along with great prosperity attained through the trading of silk, tea, and spices. Imposing structures such as the Taj Mahal and the Red Fort are built, and gorgeous gardens are created alongside new buildings and parks that will impress generations to come even centuries later. You can activate all 3 inactive workers. So you may play with up to 6 workers. You play with the back of your Kali statue and you may store only up to 8 dice. The Mogul empire was a great empire that developed in the Indus-Ganges plain in North India. At the peak of its power (17th century), it comprised almost the entire India (as we know it today) and some parts of Afghanistan.